Spring football is in the air to whet your appetite just in time for the long hot summer to arrive. This week, we'll take a look at how the Big 12 played out in 2012. For the second consecutive year, a team not named Oklahoma claimed the conference crown and the requisite BCS berth (though the Sooners did share the title). To catch you up, here's a link to last year's Big 12 post. First here are the 2012 Big 12 standings. 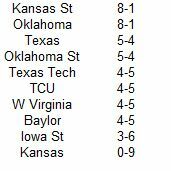 And here are the 2012 Big 12 standings. The standings are sorted by total SDPI with ranking for each category (out of 10 teams) in parentheses. To say there was parity in the Big 12 last season would be an understatement. Nine of the league's ten teams finished bowl eligible, and eight concluded the postseason with a winning record. 60% of the teams in the conference finished with either four or five league wins, culminating in quite a log jam as four teams finished tied for fifth place. Fresh off a season that nearly saw them play for a national title, and their first top-five finish since just after World War II, the Oklahoma State Cowboys were destined to regress. However, their five win conference season could easily have been seven. The Cowboys started three different quarterbacks thanks to a slew of injuries, lost three conference games by a touchdown or less, and finished outside the final polls for the first time since 2009. Rest assured though, Mike Gundy's team has reach a new floor. With more experience and a little better luck in 2013, the Cowboys will be in the running for another league title. I've made no secret of my affinity for Kansas State and their legend...wait for it...dary coach Bill Snyder. However, while the Wildcats were certainly a solid team, their statistical profile did not befit a team in contention for the national title until the season's final weeks. Kansas State did the little things well in 2012 to acquire such a sterling record. They forced a league-high 26 turnovers in their nine conference games, while committing a league-low seven for an amazing margin of +19 (Iowa State was second in Big 12 play at +5). While turnovers are somewhat a product of skill, they can be a fickle mistress, and one can be almost certain Kansas State will not post such a spectacular in-conference turnover margin in 2013. Sans RG3 and a few other former Bears now in the NFL, Baylor actually averaged 19 more yards per game in Big 12 play. The Bears topped 600 yards in five of their nine Big 12 games. Yet, they actually dropped two of those games. What could possibly be the reason for that (foreshadowing)? 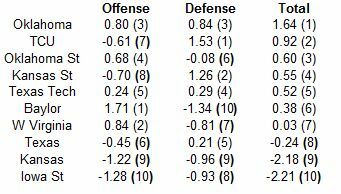 In a league where offense was the norm, Iowa State was held to twenty or fewer points in four of their nine conference games. Perhaps not surprisingly, their three conference wins all occurred in games where they scored at least 30 points. Their first year in the Big 12 wasn't all they hoped it would be, but TCU still fielded an elite defense. The Horned Frogs held six of their nine league foes to fewer than 400 yards of total offense. This is why Baylor lost a pair of games during which they gained over 600 yards (including one where they gained an even 700. Six conference opponents gained at least 500 yards of offense against the Bears. In 2011, Kansas State boasted a fantastic in-conference turnover margin of +13. In 2012, they bettered that number to the tune of +19, giving them a turnover margin of +32 over two conference seasons. That is the largest in-conference turnover margin for a team from a BCS conference over that past eight seasons. Feast your eyes on the Wildcats and the rest of the top-10. We're almost five months away from any real amateur football (at least outside of Auburn) being played, but hopefully these SDPI recaps can keep you satiated. This week, we turn our attention to the nation's heartland, and the Big 10. 2013 will mark the final year of the Big 10 featuring twelve member schools (this incarnation will have lasted only three short seasons) as Rutgers and Maryland will join for the 2014 season. To catch you up, here is a link to last year's Big 10 post. 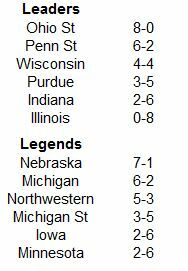 First here are the 2012 Big 10 standings. And here are the 2012 Big 10 SDPI standings. The standings are sorted by division by total SDPI with ranking for each category (out of 12 teams) in parentheses. Wisconsin lost six games in 2012, a total very unbecoming of a champion from a major conference, much less a Rose Bowl participant. However, each loss came by seven points or fewer, and an amazing four losses came by exactly a field goal. In their four Big 10 losses, the combined margin of defeat was 16 points. None of their four Big 10 wins came by fewer than 17 points. Wisconsin bludgeoned the teams they were superior to and lost tight contests to their equals. If the Badgers had caught a few more breaks, 2012 could have resulted in a third-straight top-10 finish. The Buckeyes rang in the Urban Meyer era with an undefeated campaign. Unfortunately, they were ineligible for the conference crown and the postseason, so no banners will be hung. That could be poetic justice since the Buckeyes hardly had the makings of a powerhouse. The Buckeyes were solid on both sides of the ball, but this was hardly a juggernaut that rolled through the Big 10 leaving wolverine, lion, and badger carcasses in its wake. Fully half of their 12 wins came by a touchdown or less, including narrow escapes over luminaries like Cal, Indiana, and Purdue. Give the Buckeyes credit for their wins, but this team was not elite. More on that in just a bit. Bill O'Brien took over a reeling program and improved its offensive output from 345 yards per game in Big 10 play to 437 yards. No one will confuse the Penn State offense with the vintage Texas Tech teams of Mike Leach, but they were the best the Big 10 had to offer in 2012. 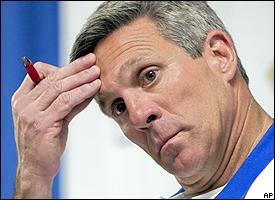 If you looked really closely on the Illinois sideline, it almost appeared as if Ron Zook was still coaching the team. The Illini averaged just 272 yards per game in league play and now are the proud owners of a 14-game conference losing streak. Only a single Big 10 team gained more than 400 yards against the Spartan defense all season. 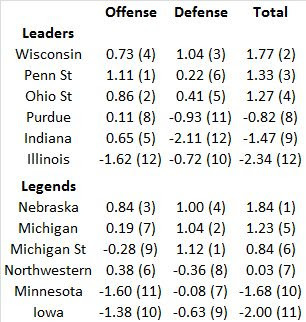 The Hoosiers had an interesting statistical sandwich in 2012. In their first three conference games, all defeats, they allowed 564 yards and 42.3 points per game. In their next two league games. both wins (their first conference winning streak since 2007), they allowed 359 yards and 19 points per game. Then, with bowl eligibility still a feasibility, they allowed 570 yards and 54.3 points per game in their final three league games (all losses). Ohio State finished the 2012 season undefeated and ranked 3rd in the AP Poll. It marked their third undefeated regular season since 2002. However, thanks to shenanigans during the previous administration, the Buckeyes were ineligible for the postseason and were not given a shot to play for the national championship. Did they deserve one? How good were they? 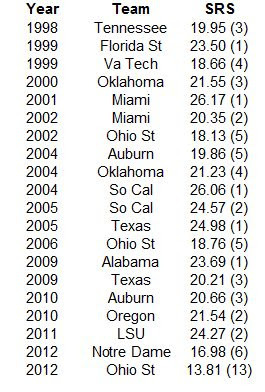 To attempt to answer those questions, I looked at every team from a BCS conference that finished with an undefeated record prior to their bowl game since 1998 (the beginning of the BCS era). Including Ohio State last season, 20 teams have accomplished this feat. To objectively rate those teams, I used the Simple Rating System at college football reference dot com. The SRS uses margin of victory and strength of schedule to calculate how many points above average a particular team is. For instance, last season, Ohio State finished with an SRS of 13.81, meaning they were about two touchdowns better than an average team. This ranked 13th nationally. The results for the 20 teams are summarized in the table below. Last year's Buckeyes were clearly in a class all by themselves. No other undefeated team from a BCS conference had performed at such a low level. No team had finished with an SRS score outside the top-six. Only one other team had finished below 17 points above average, and that was last season's Notre Dame team that was waxed by Alabama in the BCS National Championship Game. Remember, Ohio State didn't have a bowl game against an elite team to drag down their rating. Ohio State was good last season, but they didn't belong in the national championship game. Any team that struggled to put away Cal and Purdue at home, and Indiana on the road was probably not worthy of gridiron immortality.